Lanre feels completing his degree at City reinforced his abilities to be organised, disciplined and focused when taking on new challenges. 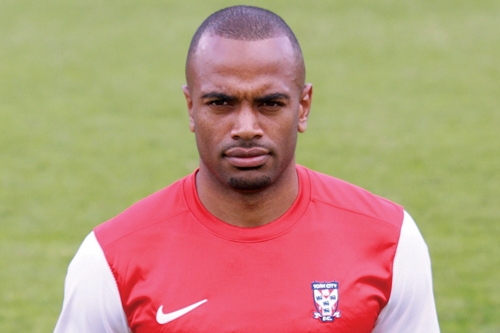 Lanre is a professional footballer who combined his degree in Mathematics and Finance, during his first year at City, with his training sessions at York City FC. In his first season the club won the FA Trophy and gained promotion to the Sky Bet League Two in a playoff final at Wembley Stadium. In June 2014 he joined League One side Crawley Town FC. His job as a footballer involves training four times a week, competing in matches once or twice a week and, in the days leading up to a game, analysing the opposition and working on tactics and formation. Lanre says: "What I enjoy most about my job is the whole matchday experience. Running onto the pitch and hearing the fans roar gets my adrenaline pumping. This is where all the week's training comes into action and where everything really counts." Completing his degree at City allowed Lanre to reinforce his abilities to be organised, disciplined and focused when taking on new challenges and achieving results. He also feels that having a degree will help him when he retires from football. Talking about his ambitions he says: "I aspire to play at the highest level possible and become the best footballer that I can be." Find out where Mathematics and Finance at City could take you.